1. The reservoir tank which contains the insecticide product to be metered out through the system. 2. The pump, motor and timer which control the application of the insecticide, both on a manual basis with a remote control or on automatic timed sprays. 3. The network of strategically placed misting nozzles throughout the yard area, taking into consideration harborage and breeding areas of mosquitoes, no see-um and other flying biting insects. The bug slayer mosquito control system is made from robust components. The system is geared to be there for you for years and years of continuous service. 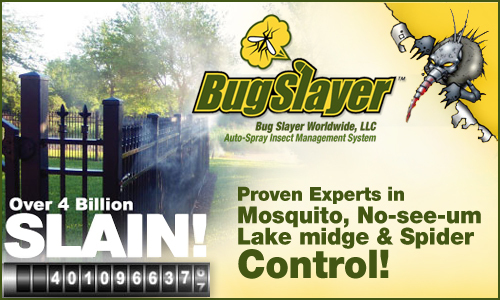 Take the opportunity to check us out and see how bug slayer can work hard for you.